Getting my younger son out the door with a bit of breakfast in him is a challenge. He’s not really a breakfast guy and would prefer to eat later in the morning at school, which is alright IF he does it. So we talked about what he’d like me to have on hand for quick and easy eats in the morning. He suggested some of those frozen breakfast sandwiches. You know the brand, the one with the guy in that costume? Ahem. Please excuse my language but, ARE YOU SHITTING ME!? I looked at the box and read the serving size is two of those. I must say that I’ve had limited experience with this kind of product, but I figured whatever to get the boy to eat right? Again, uh…no. I felt a little insulted actually. I know a lot of parents have had a literal belly full of processed packaged food, I read about it on-line all the time. I see lovely recipes on Pinterest for homemade healthy makeovers of fast or processed foods. It was all very interesting but I never thought I’d give it a go until this morning. Toast the English muffins under the broiler for 2 minutes then set aside. Scramble the eggs one at a time over medium heat using egg rings or a single serving mini pan. If your making a lot try using a muffin tin in a moderate oven stirring every minute or two. 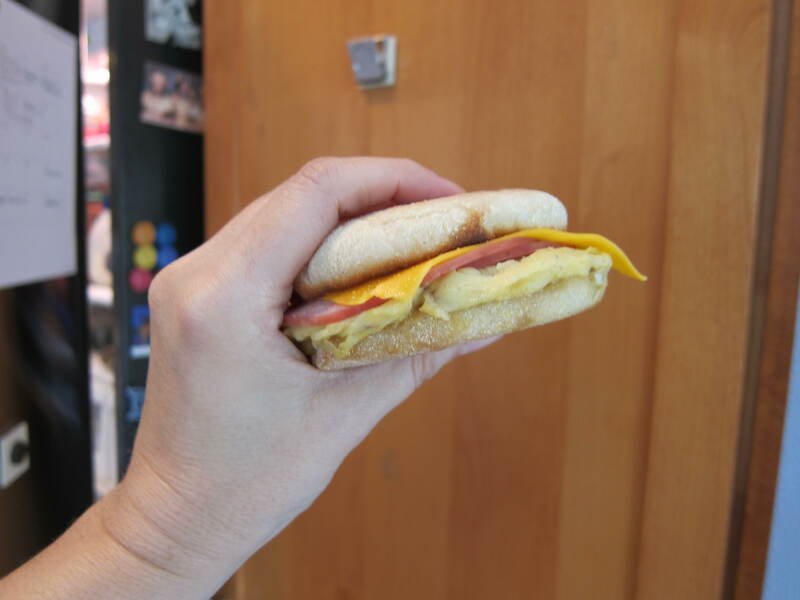 Slide the eggs onto the English muffins, and then add the ham and cheese. Pop on the top. Allow the sandwiches to cool then wrap with cling film and place in the fridge. 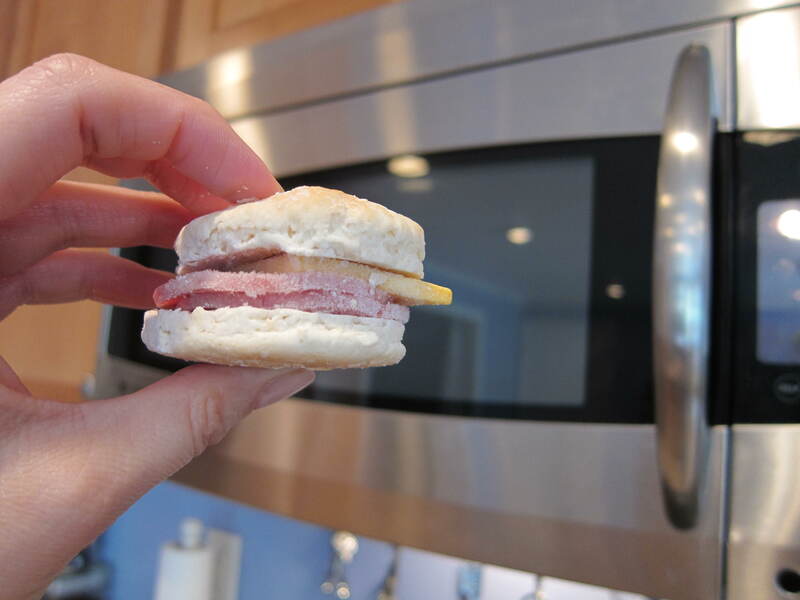 To re-heat: Unwrap and heat in the microwave for 20 seconds. So, it took me 30 minutes to make and assemble them. 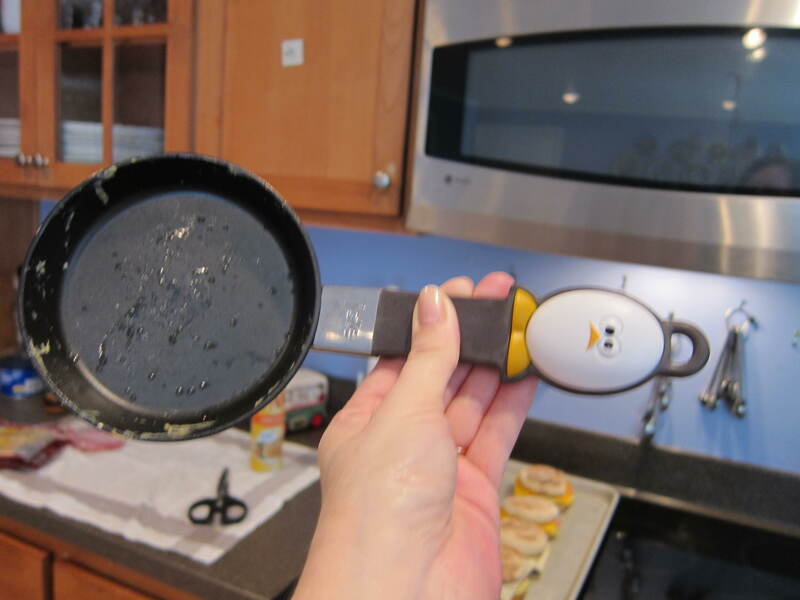 Even cooking the eggs one at a time in my twee little pan. Yes I bought it because it’s cute. Wanna make something of it? I guess the lesson I learned here is: If you want something done right, do it yourself. Edit: I looked closer at the box yesterday and read that this was the “snack size” of this brand. So I do applogize for trash talking about the size of your buns Mr. Sunshine Costume guy. PPS. They’re still too small! Whoa! Those really are small!!! I think they must use a magnifying glass to see them on TV.. Your take on those looks good, will try!